Today, a Sunday, (no surprise, a blog day), I drove up northward to attend the Mass Sheep and Wool Festival, and had a short but great time. I drove the back roads there, as the crow flies, and it was almost 30 miles longer than the less direct but bigger roads home! Egad! We spoke for all of 30 seconds; probably she didn’t expect a fiber-club Junky fan to be quite so old and socially inept! 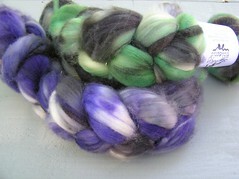 But I did buy two superwash merino hanks of fiber, and hope to actually spin sock-worthy yarn. They are Soylent and Purple Haze; can you guess which is which? 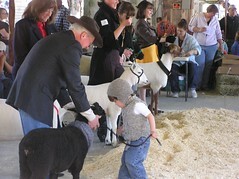 I watched the end of this competition; it had to do with sheep, people, and what the people were wearing. 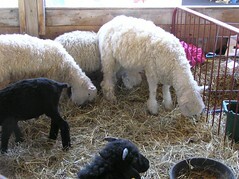 The gentleman, black sheep, and child (grandchild?) won the category for adults and children, Too cute! 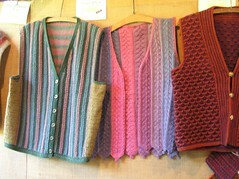 She dyes the yarns for these vests; I am a vest lover, and wish I’d gone back to get her name or to see if she sold the patterns. I wasn’t going to but I did– buy more roving. This 8 oz. 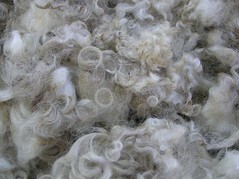 was from Gurdy Run Woolen Mill in Halifax PA; it’s a wool, ?, and silk roving. 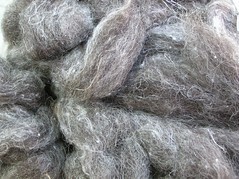 I thought this gray fiber, and the next, from Biltmore Wool Barn from Brewster, MA. 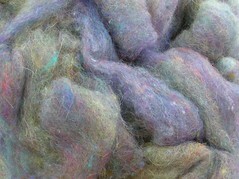 a mystery roving with sprinkles of color, would both work with yarns I am spinning for a vest. In fact, they may get plied together. 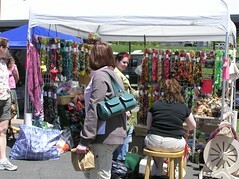 I had a fine time; what spinner/knitter doesn’t enjoy a fiber fest! On the way home I shot photos out the window; some of them may turn into paintings, and if they do, I’ll blog about it here! 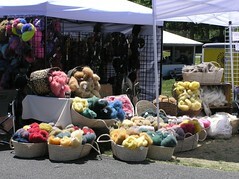 This entry was posted in fiber, fleece, spinning, yarn. Bookmark the permalink.